A congratulatory document signed by Senator Birdwell can be provided in recognition of special events such as birthdays, graduations, wedding anniversaries, Eagle Scouts' Court of Honor, church anniversaries. A Texas flag can be flown over the State Capitol on a specified future date and a personalized Certificate will be created for the recipient of the flag. The 3' x 5' nylon flag is $17.25 and the 3' x 5' cotton flag is $22.25. 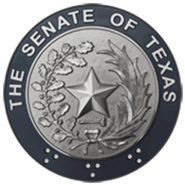 During the legislative session, Senator-sponsored students between the ages of 6 - 18 can serve as an Honorary Page For A Day in the Texas Senate. Shifts are three hours and must be arranged through our Senate office.